Due to her parents’ promise at her birth, Lady Rosemarie has been prepared to become a nun on the day she turns eighteen. Then, shortly before her birthday, a friend of her father’s enters the kingdom and proclaims her parents’ will left a second choice—if Rosemarie can marry before the eve of her eighteenth year, she will be exempt from the ancient vow. Lady Rosemarie lost her parents four years prior to a plague. Ever since then, she has been preparing for a life in the convent due to a promise her parents made at her birth (of which she only discovered after their deaths). The ancient Vow they made has no exceptions- or at least that’s what Rosemarie thought until the Duke, her godfather, rides into her village. He informs her that if she can fall in love and marry before midnight on her eighteenth birthday, she will be exempt from the Vow. There’s only one problem- her birthday is only a month away. Thus begins a contest between three handsome, worthy knights to win the Lady’s heart. But when problems arise in the form of attempted murder, all fingers point to the one man who may hold her heart. Who can Rosemarie trust? 12 AM- Omgomgomg. This is getting good. *girlish giggles* It’s midnight already? Ok, just a few more chapters. 1 AM- I should go to bed now, right? Right?! 2 AM- Must. Have. Self. Control. And. Go. To. Sleep. Ah, forget it. I HAVE TO SEE MY NEW OTP BE TOGETHER FOREVER. Need I say more? This book turned out to be one of my all-time favorite YA historical fiction reads, right up there with Lisa T. Bergren’s River of Time books and Melanie Dickerson’s Fairy Tales. I adore books that are set in medieval times with adventure, romance, and suspense and An Uncertain Choice had all that and more (is this really Hedlund’s first YA novel??). I’m really sorry about the excessive fan-girling here, but I can’t help it. I LOVED this book. Some things I liked in particular about An Uncertain Choice- I had such fun getting to know the characters. Rosemarie and the three knights were described in such vivid detail that it was like a movie playing out in my head. She was an awesome heroine, with true inner beauty and strength- making her love triangle not bothersome at all (as some tend to be). She was truly just trying to discover what love is and the message there is genuinely uplifting. The danger and intrigue in the story were somewhat predictable, but that didn’t take away any of the excitement. The end promises more adventure to come for Rosemarie and I am SO excited for the continuation in this series! I hope we get to see how the other knight’s stories play out as well. 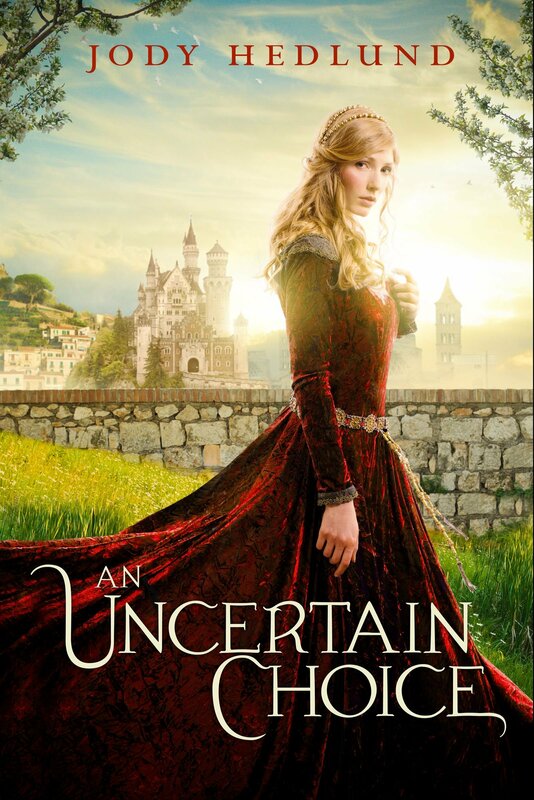 Have you read An Uncertain Choice? If so, how did you imagine the characters? Are you a Jody Hedlund fan? Thanks for visiting Will Bake for Books! I love your fangirling, Bekah! Hilarious! 🙂 And your internal monologue is perfect: *Checks goodreads* I love that you did that and then were able to sleep because you knew it was a series and we get more YA books from Jody! haha. And I’m really loving your choices for how you imagined the characters. It must have been fun to search for how you pictured them! Yes, well, I maaay have gone a bit overboard with my enthusiasm but I just couldn’t help it. It was so good! I don’t think I’ve read any books from Jody Hedlund (I’ve seen you’re a fan and told myself to try soon), but now that I have whenever I think about her books what comes to mind is that Queen song, “I want it all”…haha! I actually have Rissi and you to thank for trying this book out- your reviews convinced me. 🙂 It was definitely fun to put that character collage together! I love doing that when I really like a book. I knew I was going to like it from the reviews I’d read (yours and Cassie’s, e.g.) but I didn’t know HOW much…haha! Seriously, I’m tempted to track down and buy all of Hedlund’s novels. 😉 Same here- I’m so excited to see what happens next. Thanks for stopping by Rissi!